My eleven-year-old Kyle enjoys Science. He's a very precocious lad who likes to take things apart and tinker with them. In fact, if he had been a girl, it would've been more apt to call him Peter Pan's popular sidekick, Tinkerbell. 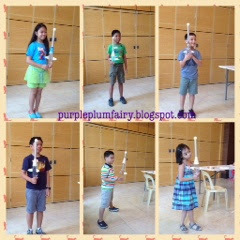 So when Mommy Roxi posted an invite on Mommy Bloggers Philippines' group page that she was looking for mommies and kids to try Engineering for Kids--an after school program for kids, I was one of the first respondents. I knew that this would be something which my beloved Kyle would enjoy. I had signed him up for Engineering For Kids' Junior Apprentice program which fits his age. Engineering For Kids like I've mentioned is an after school program which brings Science, Technology, Engineering and Mathematics (STEM) Education to ages 4-14 years old kids in a fun and challenging way through classes, camps, clubs and parties. They have their very own Engineering Design Process which aims to help children build solid problem solving skills while encouraging them to discover how things work. Kids explore Science concepts and they get motivated in Math as well while on the said programs. Each of their units are designed to meet US national standards in STEM education. They have programs in Aerospace Engineering, Civil Engineering, Electrical Engineering, Chemical Engineering, Mechanical Engineering, Marine Engineering, industrial Engineering, Electronic Game Design and Robotics. They have three levels of curriculum depending on age range namely: Junior Engineers (ages 4-6), Apprentice Engineers (ages 7-11) and Master Engineers (ages 12-14). We were scheduled for the trial last July 26 and since I had mentioned to Kyle about it, he has looked forward to that day. Engineering For Kids was a bit difficult to find especially if you're like us who weren't exactly familiar with Bonifacio Global City (BGC) in Taguig, being someone from Quezon City. Unfortunately, my knowledge of BGC were limited to The Mind Museum, Bonifacio High Street, Serendra and Market! Market! I knew these places simply because I had attended events in these areas. 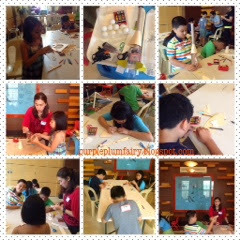 So on that particular Saturday, Kyle and I had to travel all the way to BGC for the Engineering For Kids trial class. 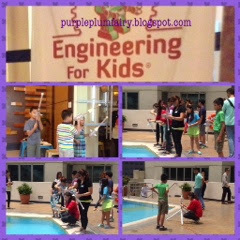 Engineering For Kids is at the Forbeswood Residences--yes, it's located on the fifth floor of a condominium. And because of my non-functioning GPS system, Kyle and I had arrived around 30 minutes late from Engineering For Kids Junior Apprentice Class. On that particular day, Engineering For Kids students were about to make Bottle Rockets. Students learns how simple air pressure can jettison a rocket more than one hundred feet in the air. At the end of the lesson, they are expected to build a large model rocket that is capable of launching using pressurized air and water. When we got there, one of the teachers asked Kyle if he can cut cardboards really fast because the class would be out in 30 minutes to fly their handmade rockets up in the air. Upon hearing what the teacher said, Kyle nodded and wasted no time, he had taken his seat right away and started cutting boards. There were only about six kids on the said apprentice class (with Kyle being the 7th kid) on that day. They all had their hands busy doing a rocket engine from clear bottles, pingpong balls and cardboards. Everyone were excited to finish their very own personally designed rocket. Children were all-a-buzz on how far will their own rockets' fare once they go out on the outdoors. I pity my dear Kyle as he looked so stressed and pressured as he worked on his own rocket. Oh well, that day was one of the few times when I've arrived late on events. When finally everyone was finished, each child had his or her picture taken with their own rockets. 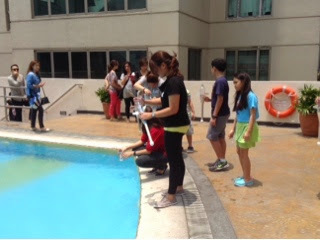 The entire class together with the teachers (there were about three or four) went out to the Forbeswood Residences' Pool and Playground area (also on the fifth floor) to make their rockets soar up into the air. Teacher asks the kids who'd like to go first to launch his/her rocket. 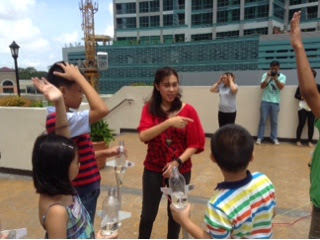 The teachers assisted the kids in putting water unto their bottle rockets. The children cheered after each rocket soar up high in the sky. They clapped their hands and crossed their fingers that their rocket would soar higher. Seeing Kyle experienced and witnessed his own rocket soared into the sky, was like seeing him as three-year-old--it's some sort of a deja vu, he had actually looked the same when he first went to preschool, only this time he's a lot taller now. Kyle had that sense of awe in his eyes and I knew he had truly enjoyed the Engineering For Kids experience. And I know most Moms would agree that when you see these things in your kids, you know very well how much you've made them happy. Had it not been for another commitment, Kyle and I could've stayed longer. But right after Kyle had his turn to make his rocket fly, we bade the teachers goodbye. 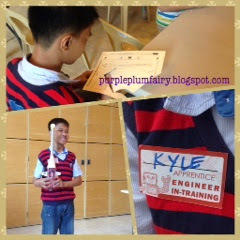 As we went home that afternoon, Kyle said he liked the experience of trying out the Engineering For Kids program. "I really had a lot of fun today. It's just a bit sad that this program is only available here (BGC). I wish they'd have a branch in Quezon City soon (meaning somewhere near where we reside. )," Kyle said. Interested? 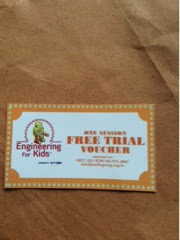 I have here a one-day Engineering For Kids trial voucher which your child can use. The first to comment on this blog post gets it. Special thanks to Mommy Roxi Santiago for the one-day free trial invite. Hi, Dialyn! Congratulations! You can bring your daughter Sophia to Engineering For Kids because you've just won a one-day free trial lesson for her. Woot! I'm sure it'll be fun & she'll enjoy. Thanks for leaving a comment. Thanks for sharing this mommy! I am actually looking for after school activites for my pre schooler. Surely I will visit this as this complements what they are learning in school. Thanks for dropping by my blog & leaving a comment Mommy Desiree. I'm certainly sure your preschooler will be happy to learn while having fun. Good luck!